RUSH: Grab audio sound bite number two. I don’t know if you heard this. This is yesterday in Chicago, the Joint Luncheon Meeting: Working Together to Address Youth Violence in Chicago, hosted by the mayor, Rahm Emanuel. First Lady Moochelle (My Belle) Obama spoke about youth empowerment. MICHELLE: Hadiya Pendleton was me, and I was her. But I got to grow up and go to Princeton and Harvard Law School and have a career and a family, and the most blessed life I could ever imagine. And Hadiya — oh, we know that story. I started out with exactly the same aptitude, exactly the same intellectual, emotional capabilities as so many of my peers. And the only thing that separated me from them was that I had a few more advantages than some of them did. That was the difference between growing up and becoming a lawyer, a mother, and First Lady of the United States, and being shot dead at the age of 15. Are we truly meeting our obligations to our children? It’s a question we should also be asking in Chicago and in every corner of this country. RUSH: I thought we were making it harder to gun down our kids, number one. But what is this? What is it with these people? “If I had had a son, he’d look like Trayvon.” Now here’s Michelle Obama, “Hadiya Pendleton was me, and I was her.” What is this? I don’t understand this. The need to compare herself to this girl who was gunned down by illegal guns in the hands of gang members. What’s the point? She’s saying it could have been her, but for what? It could have been her but for what? She had advantages? What were her advantages? I mean, the idea that we’re all in this together and we’re no different from one another and it coulda just as easily been me except that it wasn’t. I don’t know that Moochelle ever was in black gang or black gang neighborhoods. Really, folks, I don’t… Yeah, she’s trying to show them she cares. She’s trying to show them that she’s not that far removed from her roots and what they are, but that’s not true. This is all about them. This is all about Michelle going there and in a calculated way exploit this circumstance. Am I wrong about that? Oh, too much truth? RUSH: Anyway, back to Michelle. What’s she gonna do to stop gang violence? “Hadiya Pendleton was me and I was her.” (applauding) (interruption) Who wrote it? Who wrote that for Michelle to say? (interruption) What do you mean, “That line is so…”? How about we’re gonna make it harder to gun down our kids? Am I still the only one who thinks that is so beyond the pale? “Hadiya Pendleton was me and I was her,” except in my case, the bullet missed? Is this it? See, I’m too literal. As the mayor of Realville, I take this stuff literally, and all the symbolism? Eh, I’m not for all that. I’m not really crazy about people getting accolades for symbolism. By the way, will Michelle Obama find it worthwhile to be critical of Jay-Z for his lyrics? RUSH: No, no, no. Folks, I’m just not a style person. I’m a substance guy. Mayor of Realville. I actually have a resentment for people who get where they get on the basis of style. To me it’s phoniness. It’s insincerity. Style over substance, I call it something else, I’m having a mental block on the word I use for style. Symbolism. Symbolism over substance has always been my — so Michelle Obama goes out there, “Hadiya Pendleton was me, and I was her.” No. No, you weren’t Hadiya Pendleton and Hadiya Pendleton is not you and you two never were the same. I think what really irritates me about it is, if I’m interpreting Mrs. Obama correctly, one of the things she’s saying is, “This country is so bad. This country is so messed up — so whatever — that it’s just the luck of the draw that I got out. It’s just the luck of the draw that I wasn’t a victim of this kind of violence.” And, see, with me, analyzing people on the left, they’ve always got a chip on their shoulder about this country. This country’s flaws are what they focus on and exploit and see. It is not the country’s fault that there are out of control gang murders in Chicago. It’s not the fault of the Second Amendment. It isn’t the fault of the Founding Fathers. It’s the fault of the people who are pulling the trigger. In this case, it’s young gang members in Chicago. Now, if you want to find out why they exist, go look for it, but don’t tell me it’s because of the Constitution. And don’t tell me it’s because of capitalism and unequal distribution of resources which has led to poverty in the inner cities, which has led to young gang members shooting people for the fun of it. But this is, I guess, what they believe. Capitalism has led to poverty, which has led to desperation, and anybody who escapes capitalism is just lucky, or anybody who escapes death, anybody who escapes failure, misery, whatever, in a capitalist system, is just lucky. So when I hear the president say, “If I had a son, he’d look just like Trayvon,” I know what he’s doing, and when I hear the first lady compare herself to a murdered teenager, I know what she’s doing. And it’s a disservice. It’s a disservice to the country. I love the country so much. I’m literally depressed over what’s happening to it. I’m really mad at how easy it apparently is to turn rationality upside down and to the point that it doesn’t exist. RUSH: Here’s Torsa in Mobile Alabama. Hi, Torsa! You are first today. Great to have you with us. Hi. CALLER: Mega dittos, Rush. Nice to finally talk to you. CALLER: I’ll get right to the point. I’m a black woman. My views are more conservative. I am not an Obama supporter. I do agree with the majority of things that you say and/or you report. However, I feel that you went too far about Michelle Obama trying to show empathy for the young woman who was gunned down in a senseless crime in Chicago. RUSH: Interesting. How did I go too far? CALLER: Well, you kind of mocked it, and you tried to belittle what Michelle was saying. Michelle was similar to this young lady. This young woman was not a gang member. She was an honor student who was gunned down in a senseless crime. She was mistaken for another gang member, which she was not. So Michelle was right in a sense. She was just like this young woman. RUSH: You know what, Torsa? RUSH: You are, for the most part, exactly right. The reason you’re exactly right is this is a no-win. Even if I were able to articulate what my real discomfort with this is — and I’m not able to. It’s not that I don’t know what it is. I’m just not able to put the words together. RUSH: Even if I were able to do that the way I want to, nobody’s gonna understand it. It’s gonna be seen as a diss of Mrs. Obama, and so I should probably just let it go and react to it like everybody else does and say, “How wonderful. It’s great that the first lady cares,” and just be done with it because there’s no upside. CALLER: Well, Rush, I’m sorry — and I want to be quick because I know you have other people that you need to take. RUSH: Don’t worry about that. This is your time. This is your time, and you determine how long you’re gonna be on by how interesting you are. CALLER: (chuckles) My point to you is that, you know, by me being… I started listening to you a couple of years ago right before the first inauguration of Obama. I got hooked on to you by my dad. CALLER: (laughing) Yeah, you’re right. More than a couple. CALLER: My dad, we always talk politics. He got me to listen to you. However, when I first started listening to you, I would continuously turn it off because some of the stuff that you said, some of the points that you made, even though they were correct, there was a bias in me. RUSH: See, here’s the thing. Let me try again. My problem with this is there are laws. There are gun laws that are not being prosecuted in Chicago. Chicago’s run by the Democrats. Obama’s from there. There’s no reason for this to be happening in that city. They could be making far more concerted efforts to stop this and punish the perps than they’re doing. So would Mrs. Obama go to her husband and get him to start prosecuting federal gun laws and violations? I mean, we don’t need any new gun laws. We got plenty of laws already on the books that make what’s happening in Chicago illegal. Why isn’t somebody going after these people that are pulling the trigger, instead of exploiting these circumstances for the advancement of the Obamas? That’s all I’m trying to say here. CALLER: Right. And that right there, I could take that point. If I tried to get one of my friends to listen to your show to get a different point of view, if they heard the mockery — you know, the points that you were making earlier — they would turn it off, and they would hear no more. CALLER: I took it as you were mocking her as not being sincere. CALLER: I felt that you weren’t. RUSH: Well, see? That’s what I mean. That’s my point. No matter how I said what I really think about this, that’s gonna be the take, and you’re right. I should just leave it alone. There’s nothing to be gained here anyway. RUSH: I’m just saying, we don’t need any more gun laws. We’ve got plenty of gun laws. Mrs. Obama can make all the speeches in the world, but that’s not gonna solve the problem — and having everybody realize how much they care isn’t gonna solve the problem. There are ways to deal with this that they are not using in Chicago. It’s a shame these people are getting gunned down! I can’t believe the death toll in Chicago every month is what it is, and all we hear is we need new gun laws. No, we don’t. We’ve got plenty of laws on the books and they’re not being utilized. RUSH: Anyway, I appreciate the call out there, Torsa. I gotta take a quick time-out. Don’t go away. RUSH: Maybe Mrs. Obama could talk to Jay-Z and some of the rappers and get ’em to tone down some of the lyrics that glorify the use of guns? Never mind! Sorry, folks. I didn’t really mean to say that. I take it back. Sorry. I can’t win no matter what. 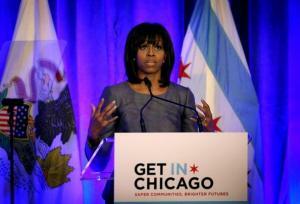 Chicago Sun-Times: Michelle Obama in Chicago: Â‘Hadiya Pendleton was Me, and I was Her"